During the 1840s travellers moving north from Pietermaritzburg crossed the Umgeni River just west of present day Howick at the Alleman's Drift. In 1849, the Wesleyan Missionary James Archbell bought three farms above the northern bank of the Umgeni River. Title deeds of the original plots simply named the area "The Village on the Umgeni Waterfall". In 1850, the river crossing was moved to the dangerous but more convenient spot at the top of the Falls. This was less than 200 metres from where the river plunged over the cliff's edge. It was a treacherous spot, and many travellers and wagons were swept over the falls. With the increase in traffic to the north, the Government decided to establish a village at the crossing, and purchased part of James Archbell's farm. 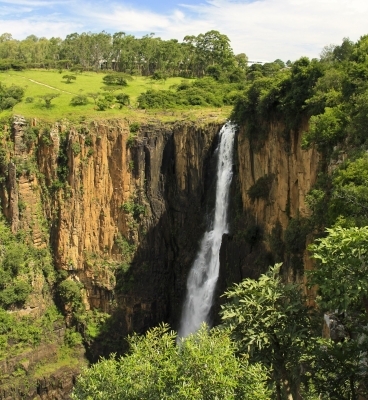 In November 1850, a proclamation appeared in the Natal Government Gazette, offering 36 village allotments on the Umgeni Waterfall Drift for sale. This marked the beginning of the town. In choosing a name for the new town, Government officials decided to honour their Secretary of State for the Colonies in London. He was Earl Grey, and had recently acquired the title of Lord Howick. The name derived from his ancestral home of Howick Hall in Northumberland, England. Two other towns were named "Howick" at the same time: one in New Zealand, and the other in Ontario, Canada. During the Anglo-Boer War from 1899 to 1902, the British established a concentration camp on the outskirts of the village. A monument to the women and children who died during their incarceration in the camp marks the location. The Umgeni Valley Ranch or Nature Reserve was established in the 1970s on the then outskirts of Howick by the Wildlife and Environment Society of South Africa (WESSA). The nature reserve consists largely of the deep valley cut by the Mngeni River below the Howick Falls into the surrounding sandstone. WESSA reintroduced game into the area, such as zebra and wildebeest (gnu), and established a number of huts for overnight accommodation. In December 1996 Nelson Mandela was awarded "The Freedom of Howick". This followed his arrest some 34 years before, on 5 August 1962, on the main Durban-Johannesburg road, as it was then — more particularly, between Howick and Lidgetton West. A small monument showing the site where he was arrested by the Security Police may be seen on the southern road side of the R102 in a dip in the road. In recent years Howick has expanded significantly following the establishment of a number of major retirement villages, such as Amberglen and Amber Valley that flank the Karkloof Falls Road.